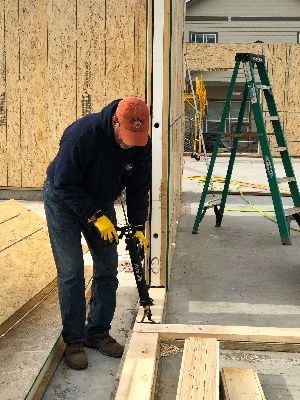 Building with structural insulated panels (SIPs) is faster and easier than stick framing. 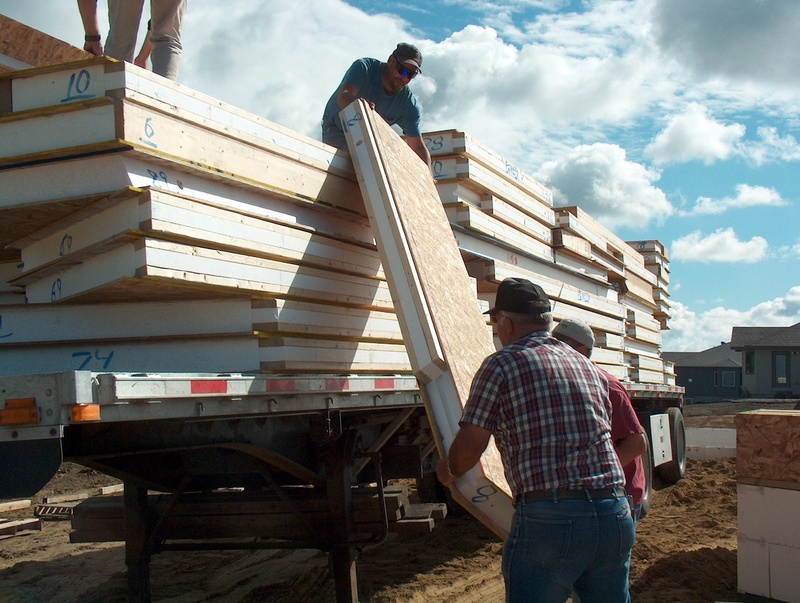 The truck arrives at your building site, loaded with your pre-cut panels, ready to unload and assemble. The next thing you know your new home is enclosed and ready to finish. Read on some tricks of the trade that will improve your overall SIP experience. While smaller panels may be handled by manpower, larger panels will require handling equipment - such as a forklift or crane. So, you will want to find out ahead of time what equipment will be needed. Because most SIP packages are delivered on a semi-tractor/trailer, the load height could be as tall as 14' off the ground. More often than not, you will need equipment to unload your panels. Don't stack panels directly on the ground. Do prepare ahead of time by having 2x-sticks or blocks spaced about 4' apart to stack the panels on. Do have at least 3 workers (plus the equipment operator) to unload panels. Do find a level surface to stack the panels. Don't try to slide the forks between panels. Do slide panels off the load and onto the forks. Do check off the load sheets provided as you unload your panels. Do sort the panels as you stack them. Do stack them so you can easily read the identifying marks or panel numbers. Don't leave your panels exposed to the elements. Do protect your panels from inclement weather by covering them with tarps or plastic. Your panel shipment should include a Construction Guide and Panel Installation Drawings. You will want to be familiar with both items before you begin assembly. Knowing the information contained in these instructions will save you time, and increase your overall satisfaction. Do study the construction guide and installation drawings before starting. Do set plate material carefully. It is important that plate material is straight and level. Sill plates should be placed a half inch in from the building edge. Don't cut wall panel skins horizontally. The panel skins provide the strength of the for walls, making horizontal cuts in the panel diminishes that strength. Do follow the manufacture's joint sealing techniques, and seal joints as you work. Properly sealing your panels ensures a tightly sealed enclosure system. Don't install panel skins in direct contact with concrete. Provide a capillary break between panel skins and concrete. Do install plumbing in interior walls. Do install proper flashing and sealants around all rough openings and penetrations as required. Don't be afraid to field-trim corner adjustment panels for exact fit. Do call your supplier if you have any questions. Once your panels are properly installed, you will want to protect them with quality roofing and siding materials. Do use proper underlayments for roofing and siding. SIP walls are airtight without housewrap, but they need a drainage plane material. 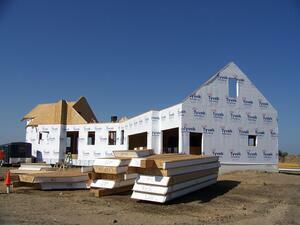 Enercept recommends and uses Tyvek Housewrap. Additionally, because SIPs are airtight, it is crucial that you install a mechanical ventilation system (air-exchanger). This equipment will maintain your indoor air quality and protect your SIP system from inside humidity.